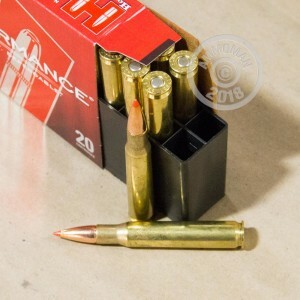 From 1906 until the early 1980's, the 30-06 was used by the US Army as their staple rifle and machine gun round. The "06" represents the year the round was adopted, and the "30" signifies the caliber. 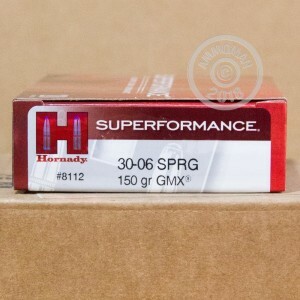 Hornady Superformance GMX bullets are uniquely designed. Not only are they formed in such a way to keep 95% of their original weight, they are made to expand to 1-1/2 times their original size, making sure that medium and big game animals are stopped dead in their tracks. 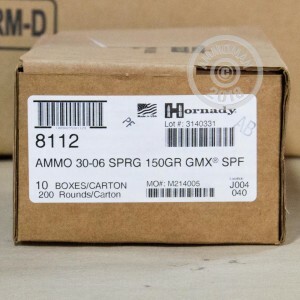 Pick up a 20 round box of 150 grain 30-06 GMX rounds today!